This is about as cute wine and cheese restaurant as you can find. It's also one of the city's favorite such restaurants. With over 30 varieties of wine served in a comfortable and cozy atmosphere, this is pretty much a one-stop-shop. The staff is very friendly and the service is excellent. You won't find much by the way of food so don't plan to have dinner here. In fact, have dinner somewhere else then come here. Cheese and light finger food is all you're getting. And it does not exclude children. Visitors are advised to buy the wine by the bottle and not by the glass. 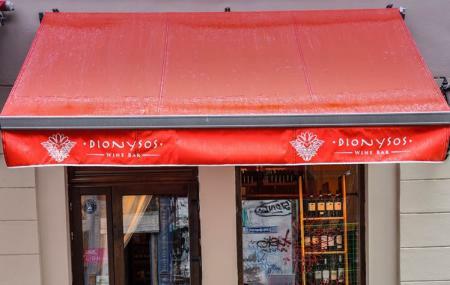 How popular is Dionysos Wine Bar? People normally also visit Biserica Sfantul Antonie- Curtea Veche while planning their trip to Dionysos Wine Bar. the best place in Bucharest to get a glass of good wine. or several glasses of wine :) the people are really friendly and they can walk you through several choices in case your mind's not made up. I definitely recommend it! Warm and perfect setup for a wine bar. Small and cozy. Passionate owner willing to tell the story behind every bottle. Amazing little wine bar. Cosy interior, fine wine, great music, warm waiters. All the right ingredients to enjoy a few hours with friends. One of the first non-smoking bars in Bucharest. Very nice wine bar. Very kind waiter, he told history about wine and proposed to try. I liked it very much.